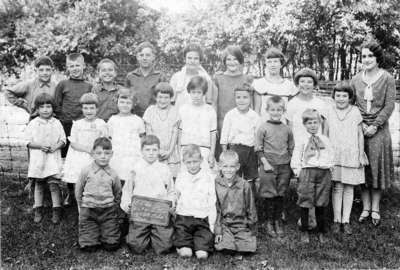 Black and white negative of a photograph of students from Spencer School. Back row: Henry Perry, Frank Parrinder, Stan Lockyer, Lewis Bird, Lillian Jones, Marjorie Parkin, Amy Ingledew, Margaret Lockyer, Ialeen DeHart, Wilheme Holliday. Middle row: Elsie Perry, Mary Jones, Helen Jackson, Ruth DeHart, Rita Parrish, Mark Lockyer, Gordon Parrinder, Ronnie Maynard. Front row: Leslie Perry, Ken Maynard, Lloyd Prouse, Wilbur Parrinder. Spencer School was built in 1877 on lot 30, Concession 7 in Whitby Township. It was known as S.S. No.6. The school closed in 1965 but the building was used as Spencer Community Centre from 1967.